The Bald Eagle Chapter, National Society Daughters of the American Revolution (NSDAR or DAR), was organized February 6, 1993. Since that time, the chapter has been committed to improving the communities of southern Utah. 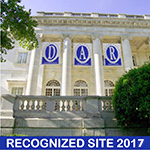 NSDAR is a non-partisan, non-profit, women’s service organization dedicated to patriotism, historic preservation, education, service, genealogical research, the arts, and literacy. The Bald Eagle Chapter NSDAR proudly sponsors yearly history essays for students in grades five and six. DAR Good Citizens award winners are picked from graduating high school seniors. This chapter also honors “Women in American History,” community leaders, and those who participate in promoting community conservation. Tree planting and making lap quilts for Veterans Day are other yearly projects.